High-Tech Sensors Help Old Port City Leap Into Smart Future : Parallels On Spain's Atlantic coast, the city of Santander has installed 12,000 sensors that measure everything from when streetlights need to be dimmed to when trash dumpsters are full — saving millions for cash-strapped public coffers. It's becoming a model for cities worldwide. 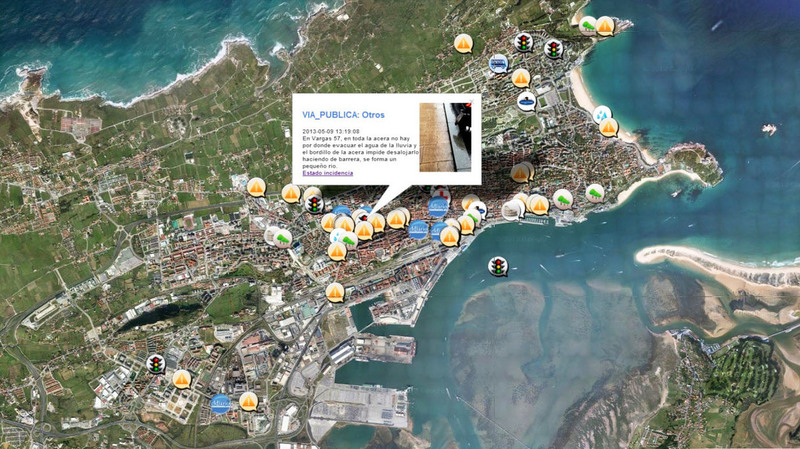 The Spanish city of Santander is using a network of sensors to help improve services and save money. Incidents reported to Santander's command-and-control center, where the city manages data from sensors and smartphone reports made by citizens, are plotted on a map of the city. Aside from the occasional ferry down from England, the old Spanish port city of Santander doesn't get too many foreign visitors. So imagine the locals' surprise when delegations from Google, Microsoft and the Japanese government all landed there recently, to literally walk the streets. What they've been flocking to see is mostly invisible: 12,000 sensors buried under the asphalt, affixed to street lamps and atop city buses. The sensors measure everything from air pollution to where there are free parking spaces. They can even tell garbage collectors which dumpsters are full, and automatically dim street lights when no one is around. 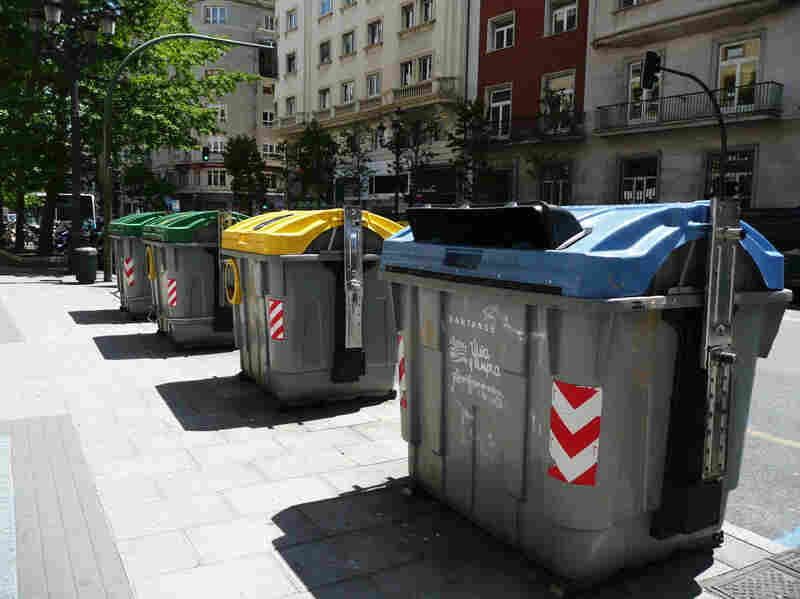 Engineers are preparing to equip all dumpsters in Santander with sensors that gauge whether the container is full or empty. The sensors then transmit data to garbage collectors, alerting them to which containers need to be emptied. It's all part of a push to save millions on utility bills, improve services for citizens and make Santander a prototype for "smart cities" across Europe. "Antennas are gathering the information coming from the sensors under the ground, and send it to the command-and-control center," explains Luis Muñoz, an IT professor at the University of Cantabria, who took NPR on a recent tour of Santander, pointing out sensors and the infrastructure they use to transmit data. Three years ago, Muñoz won an $11 million grant from the European Commission to pay for the sensors. With about 180,000 residents, Santander is small enough to be saturated with the devices, so Europe is testing them there before expanding into bigger cities. The municipality saves money, and researchers like Muñoz get to show off their gadgets for future clients. Those gadgets include street signs equipped with digital panels that display real-time parking information for every block. In addition to sending data to Santander's command-and-control center, the sensors also send it to a suite of applications on citizens' smartphones. So Santander residents can access up-to-the-minute information on road closures, parking availability, bus delays or the pollen count. 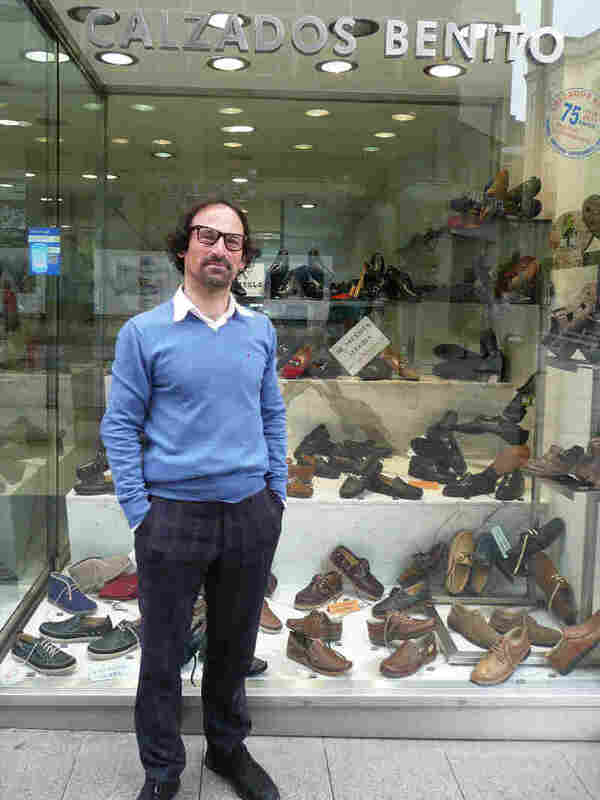 Angel Benito owns Benito's Shoes in Santander, a store that sells its wares online via the Smart Santander phone apps and campaign. And in this electronic democracy, citizens can contribute, too — by uploading a photo of a pothole or broken streetlight, for example, and sending it directly to city hall. There's an app for that. "You send us a photograph, and we try to solve that incident in about five or six days," says Iñigo de la Serna, mayor of Santander. "It took like three weeks to solve that project before having the applications." De la Serna rattles off a list of big global corporations his once-sleepy city is now doing business with: NEC from Japan, IBM and Banco Santander, among others. The IBM deal is for the Santander City Brain — a smartphone and tablet app on which the mayor trades ideas about city planning with his constituents. "People have already sent us about 400 different ideas — very, very interesting," de la Serna says. "So the citizen is like sitting with us, telling [us], 'I want to work to make this city better. I don't want only to complain.' "
Spanish streets erupt often in angry protests over the economy, but Santander appears to buck that trend. People are using their smartphones to make their city better. The city saves money — about 25 percent on electricity bills and 20 percent on garbage — and utility companies pick up the tab for the sensors' upkeep, because they save money by using them. On one of Santander's main pedestrian thoroughfares, a 75-year-old family business called Benito's Shoes has a Smart Santander sticker in the display window. The owner, Angel Benito, says he has received shoe orders from passersby, even when his shop is closed. "This is an old city. We are old shops, but we are on it. We are on the latest technologies." Benito says. "We have to do it. Because when you are in crisis, you have to ... just do it!" Over in Santander's command-and-control center, technicians oversee a huge digital map, overlaid with coordinates for every smartphone using the Santander suite of apps. "We don't register the users. What we know is a user is using this application," says IT researcher Veronica Gutierrez, who works with Muñoz, the University of Cantabria professor. "But it's the same as people do with websites." Still, some privacy advocates could be worried about Big Brother. NPR decided to run all this by Emilio Martinez, the webmaster at Santander's biggest newspaper, El Diario Montañés. Martinez, 34, is a self-professed "techie" who's not on Facebook because of privacy concerns. But he doesn't have a problem sharing data with his neighbors on the Smart Santander apps. That's what cities are all about, he says. "In Santander, everyone knows everyone. I think that behind Facebook, [there's] a commercial purpose," Martinez says. But he says the Smart Santander system is different. "I think if you offer something useful to the citizens, this is the best you can do." Bankrupt Spain may actually be fertile ground for Smart Cities like this. Local municipalities are keen to cut costs while maintaining services for citizens. And while Spaniards' average income is less than half that of Americans, they actually have about one-third more smartphones. The mayor of Santander is now the president of the Smart Cities Network in Spain. His next project? Wireless water and electricity meters for homes and businesses.